The “Little Giant,” standing at only 170 cm, overcomes the towering net and the wall of blockers. The awe-inspired Shouyou Hinata looks on at the ace’s crow-like figure. Determined to reach great heights like the Little Giant, small-statured Hinata finally manages to form a team in his last year of junior high school, and enters his first volleyball tournament. However, his team is utterly defeated in their first game against the powerhouse school Kitagawa Daiichi, led by the genius, but oppressive setter dubbed the “King of the Court,” Tobio Kageyama. 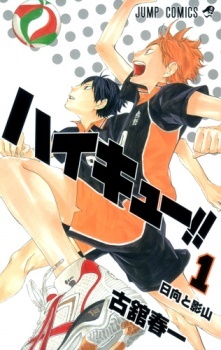 Hinata enrolls into Karasuno High School seeking to take revenge against Kageyama in an official high school match and to follow in the Little Giant’s footsteps—but his plans are ruined when he opens the gymnasium door to find Kageyama as one of his teammates. Published: Feb 20, 2012 to ?